surrounded by the majestic Coral Mountains, groves of date palm trees and a sprawling green golf course highlighted with a sparkling lake. 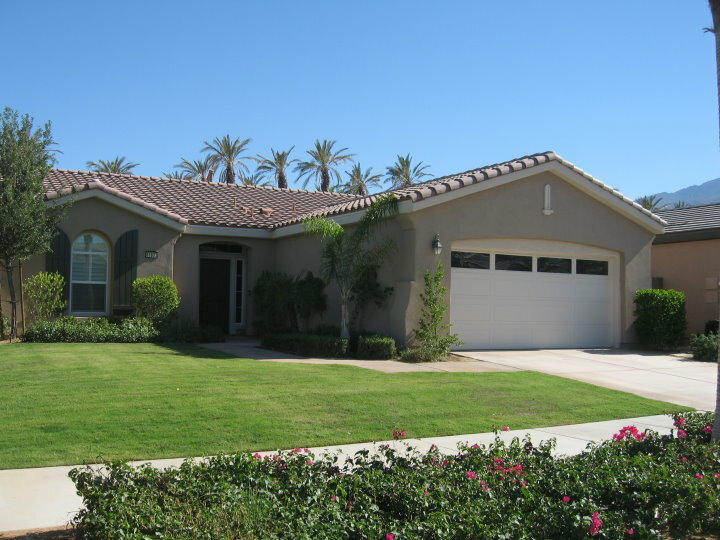 It offers an active lifestyle to those who are 55+ in a beautiful oasis in the desert. The 21,000 square foot Santa Rosa Club is expansive and hosts all kinds of events to keep the residents of Trilogy entertained and amenities to help keep them healthy, such huge indoor and outdoor pools and spas as well as a state-of-the-art exercise facility. There’s also an impressive PGA Tour-quality championship golf course, that was home to the Skins Games for years. The Coral Spa & Athletic Club is a full-service spa offering manicures, massage, treatments, and more in addition to its fully outfitted fitness center. There are also restaurants to enjoy and so much more. While there are still some new homes being built, they are almost sold out. 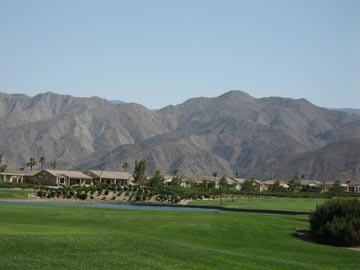 Whether you are looking for a brand new, never-lived-in home or a resale that has already been upgraded, I can help you find your perfect home here, if you decide Trilogy La Quinta, built by the well-known builder Shea Homes, is what you are looking for. There are approximately 1500 residents living in more than 900 homes currently in Trilogy, and it is expected that there will be more than 1800 people in more than 1100 homes once the community is complete. I can help you with your search for the perfect home in Trilogy whether on the golf course, or with a private pool, or whatever is on your wish list. Currently, I have a listing for a beautiful 2 bedroom, 2 bathroom, PLUS den/media room, on 81833 Sun Cactus Lane, that has been highly upgraded with designer lighting, fixtures and appliances. It’s on a quiet street that backs up to a grove of date palm trees framed by the Coral Mountains. 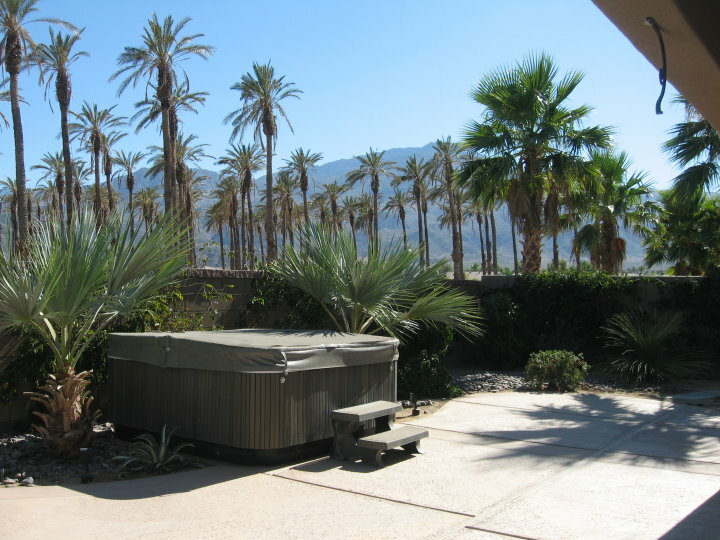 Enjoy a glass of wine or a margarita in the above-ground spa during our balmy winters and admire the stars. Imagine enjoying the stars while soaking in the spa! On the rare occasion that the winter nights get a little chilly, there is a fireplace to warm up by. The master bedroom has upgraded carpet and a huge bathroom with a walk-in closet adjoining it. Throughout the common areas there are French-limestone colored ceramic tile set on the diagonal. 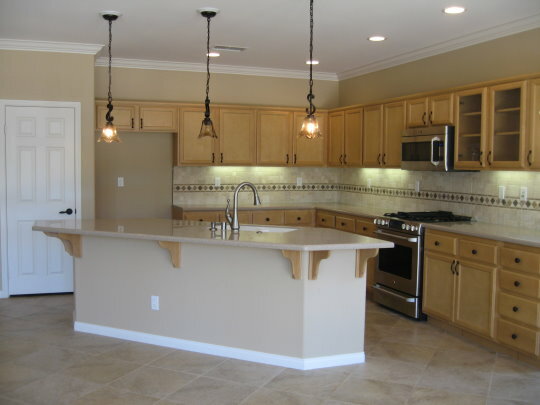 This open-space floorplan is coined as the Monterey floorplan. You can enjoy cooking up a gourmet meal using the upgraded GE Cafe’ stainless steel appliances and have plenty of space between the counters and the island to work, yet not miss any of the fun while your guests lounge in the living room area. Built-in speakers in the ceilings of the living room area and the separate den/media room enhance your acoustic experience whether listing to music or taking in a movie. A kitchen fit for the gourmet/entertainer! Life is good down here in the desert, even if you live here year-round, because thank goodness for AC! We have alot of movie theatres, restaurants and stores, although some close during the summer months, and you can always take day trips or longer to the beach cities or to the mountain areas, all about 1.5 to 2 hours away. You will find that home values are fantastic here compared to coastal Californian cities! This listing of mine that I am showcasing here is listed for $365,000. There’s not too many resort areas where you can buy a 1693 square foot house that was built in 2004 and upgraded even more since then, for this price range. 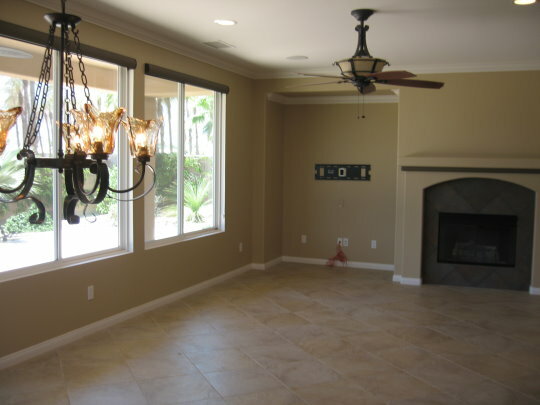 Designer lighting, ceiling fan, fireplace and views! Just add furniture! Trilogy is gated, with a guard 24/7 and patrol cars, and so it’s very secure as well. So come on down to the Coachella Valley and if you are seriously thinking about buying property down here, I can seriously help you find just what you are looking for! I can be best reached on my cell: 760-587-6009 or via e-mail: wcampbell@wendysdesertrealestate.com.